Featuring more than 56,000 entries, this thoroughly updated Seventh Edition contains the medical terminology used in more than 30 of today's fastest growing health profession areas.plus comprehensive inclusion of entries suited for the nursing field. The book includes 1,000 enriched color images and photographs, a glossy insert with detailed images by Anatomical Chart Company, more than 65 appendices, and cut thumb tabs for quick A-to-Z reference. More than 70 leading consultants from health professions and nursing contributed to the enhancements of this edition. 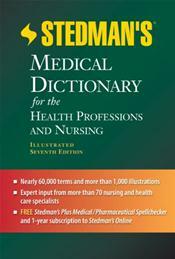 Also included with the purchase is a free one-year subscription to Stedman's Online: Stedman's Medical Dictionary for the Health Professions and Nursing, which includes all the content from the print dictionary, as well as access to 5,600 images, more than 48,000 audio pronunciations, and 48 live action videos; along with a free version of Stedman's Plus Medical/Pharmaceutical Spellchecker.